In a city with a population of over 298,000, one can find refuge in the small but tranquil neighborhood of Rabbit Creek. Even the name conjures up scenes of abundant greenery and a peaceful life. Rabbit Creek residents are fortunate to have the best of both worlds. Just a short drive from downtown Anchorage, city life is right at their fingertips but they can enjoy the quiet suburban life on a daily basis. This neighborhood is spread out over a bit more than eleven acres. The tree lined streets and safe neighborhoods make Rabbit Creek a prime neighborhood from which to enjoy life. Residents who live in the eastern part of Rabbit Creek are privileged to enjoy the mountain scenery of Chugach State Park. The third largest State Park in the United States, it boasts one half million acres of forests and mountains making this perfect for nature lovers. Rabbit Creek is a wonderful neighborhood for families boasting a park, two elementary schools, the Rabbit Creek Community Council and the Rabbit Creek Church. The Rabbit Creek Elementary School works closely with the Rabbit Creek Community Association to offer families before and after school care. This partnership also offers after school sports and other recreational activities for students. The neighborhood boasts a parent cooperative pre-school for children ages three to five years. Started in 1976, it is a well established program where parent involvement in the classroom is an important part of the daily schedule. Student to teacher ratio in the Rabbit Creek neighborhood schools is 19:1, and 97% of students graduate high school, showing that the neighborhood schools are invested in the futures of the children who attend them. The Rabbit Creek Community Council meets once per month to address the needs of community members. Rabbit Creek Church is a hub of of the community. It provides an Awana youth group, high school and college groups, and has a weekly church attendance of four hundred people. Rabbit Creek offers approximately 2,045 homes and currently has a population of approximately 4,500 residents. As of 2012, the average median income range of Rabbit Creek families ranges from $129,000 to $140,000. The average price of a home in the Rabbit Creek neighborhood is $475,800. The average commuting time to work is twenty five minutes and the current gas price runs approximately $3.93 per gallon. The median temperature in the summer months is 57 degrees Fahrenheit and the median temperature in the winter months is 21 degrees Fahrenheit. 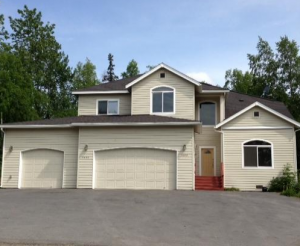 The Rabbit Creek neighborhood of Anchorage, Alaska is an ideal neighborhood in which to raise a family. With it’s dedication to safety and education, community members enjoy a neighborhood that will meet their needs and provide a beautiful and natural backdrop of majestic mountains and forested vistas. All this, while still making the attractions in the big city of Anchorage just a conveniently short drive away!